Soft gray-green round leaves are downy with a pronounced scent. 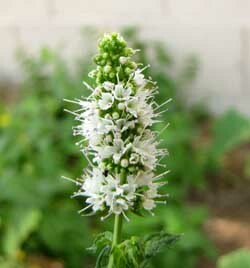 One of the tallest garden mints, applemint reaches heights the other mints don’t, sometimes clambering up two or more feet in height, but is best shorn down frequently to prevent bloom if the intent is to use it in cooking. Its fuzzy leaves and stems have a distinct minty apple taste, and it lends its flavour to applemint jelly and couscous, as well as teas that will calm upset stomach and soothe body and soul. Like most mints, applemint can threaten the garden with too much of a good thing, and in its optimum growing conditions of part shade and moist soil will quickly introduce itself to neighbouring beds and lawns. Plant it in containers, or bottomless buckets sunk into the garden bed to control its tendency to roam. Applemint is untroubled by pests in general and considered repellent of bothersome insects in the mixed border. Keep applemint growing anywhere you want to enjoy its sweet fruity scent, and close to the kitchen to easily enjoy the wonderful flavour it adds to food.